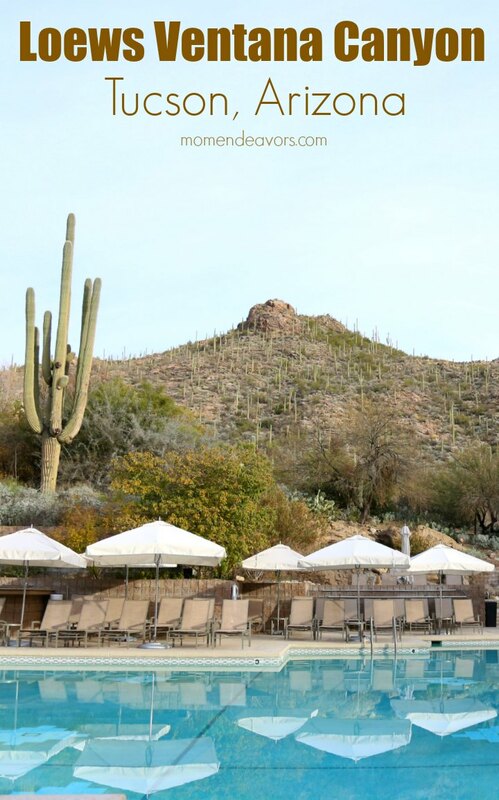 Families looking for a resort oasis escape in the beauty of the Sonoran Desert will love a stay at Loews Ventana Canyon Resort in Tucson, Arizona! Here you’ll find some of the best hiking around AND the most awesome bath tub you’ve ever seen in a hotel room!!! 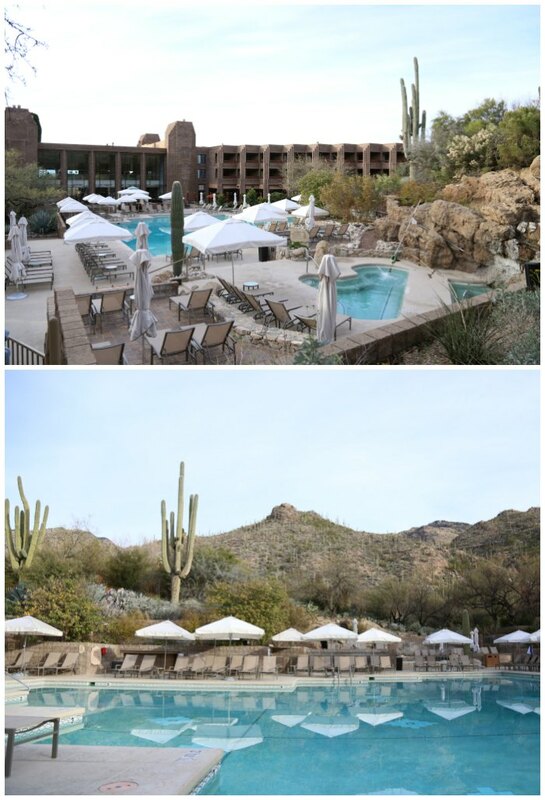 We recently drove down to our old stomping grounds of Tucson, Arizona and were hosted at Loews Ventana Canyon Resort in the foothills of the Santa Catalina Mountains. When we lived there, our absolute favorite place to go hiking was Ventana Canyon. The entrance to the hiking trail is actually right off the resort, so that’s an awesome benefit for guests staying here! 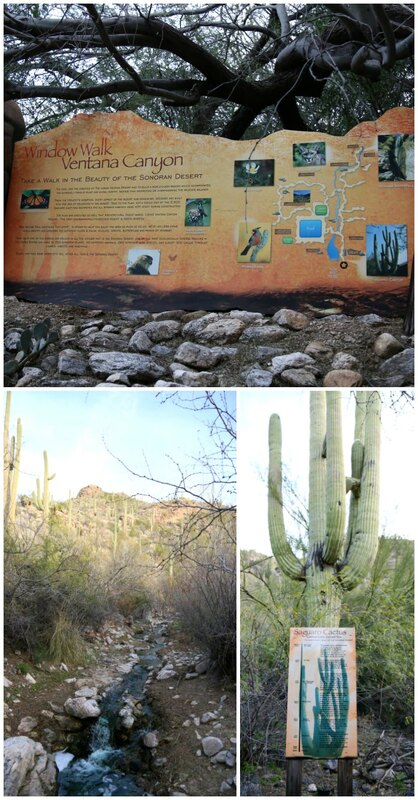 It’s not only one of the most beautiful hikes in the Tucson area, but in the entire state of Arizona! Isn’t it beautiful?! We didn’t complete the entire hike (it’s a BIG one)! But we hiked a fair way in & up, crossing the creek at least 7 times! The boys absolutely loved all the creek crossings! The first 2 miles in or so are definitely doable with even young kids, so it’s perfect for a family hiking adventure (especially during the milder weather months of October – April, when the temperatures aren’t as hot). 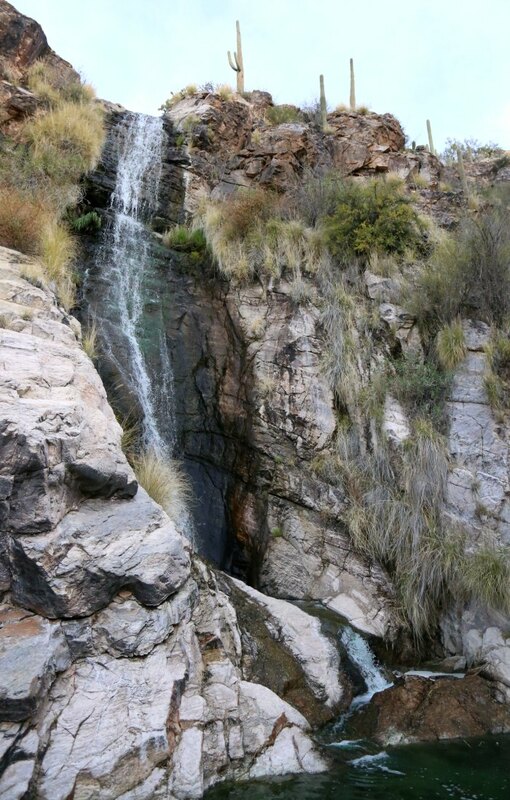 In addition to awesome public hiking trails right next to the resort, you’ll find a nature trail complete with a natural water fall ON the resort property! How cool is that?! There were informational signs and stopping points all along the trail! And, with the exception of some stairs near the waterfall area, the trail is easy to navigate for all ages & ability levels. 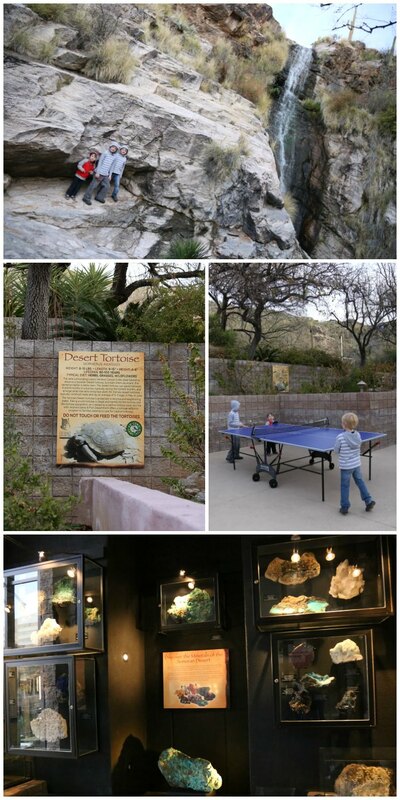 There’s more fun to be had around the grounds of the hotel too – like a desert tortoise habitat, a cool rock & minerals exhibit from the Arizona Desert Museum, ping pong and more! The pool area here is gorgeous too, with absolutely fantastic desert views. Now there’s no crazy slides or designated kiddie areas, but that didn’t stop my boys from wanting to dive right in! Of course, I would have been perfectly content in one of those lounge chairs with a tasty drink, enjoying the beautiful desert scenery! There’s such a great desert oasis vibe here! So nice! It definitely wouldn’t be hard to spend an afternoon (or a whole weekend) right here! 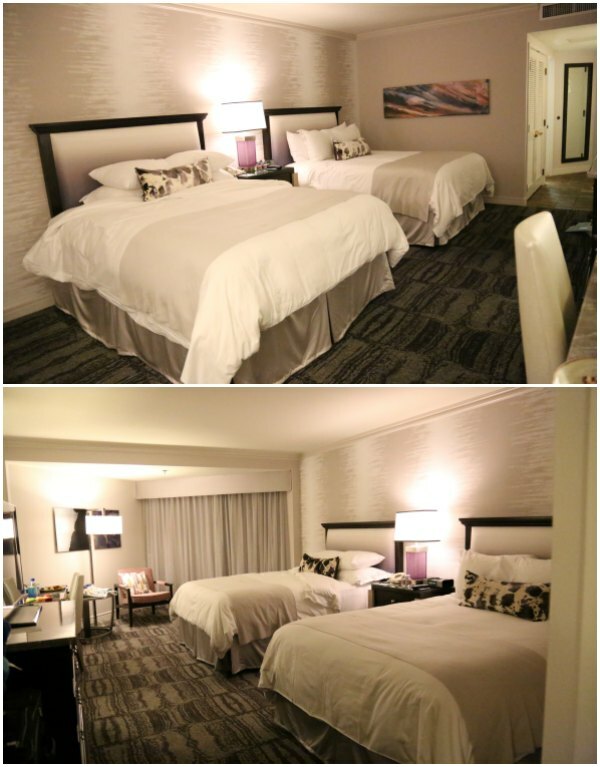 The rooms also make Loews Ventana Canyon a great choice for a family getaway! The room was plenty large for our young family of 5. The boys are still small enough that they share a bed, which makes things easy for us. There was a good amount of space to move around! The balcony made things feel even more spacious. But, the hands down most favorite thing about the room was the GIGANTIC bath tub!! Now, rest assured that this photo does NOT do it justice. There’s no good size perspective here. But, suffice it to say that this is like having your own personal hot tub in the room! My 3 boys enjoyed the most epic bubble bath ever with room to “swim” as they said in the tub. 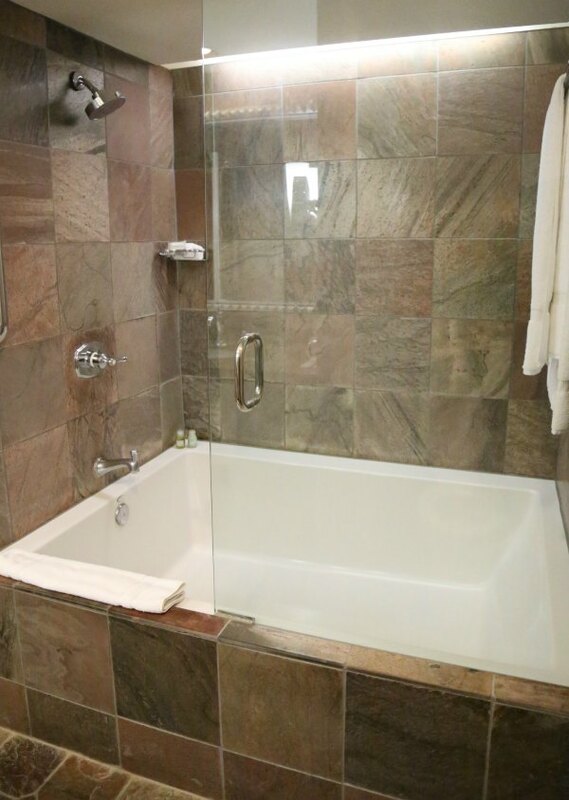 I’m about 5’3″ and if I laid on the diagonal, with my head in one corner, I could be completely flat in the tub! Totally insane and amazing! We’d come back just for the bath tub alone! After you’ve had all that fun…and gotten all cleaned up in the tub, you’re going to be hungry! And, there are some great dining options at the resort! The fan favorite (even among local Tucsonans) is the Blues, Brews & BBQ Sunday Brunch. If you’re staying at the resort over the weekend, make sure to splurge for this. There is something on the menu for absolutely everyone – a full spread of breakfast options (complete with an egg/omelet station), specialty juice shots, fresh fruits, a huge assortments of salads, sea food, all kinds of grilled goodies and more! Everything was SO good! We especially loved the juice shots and all the grilled goodies outside. So tasty! And, needless to say, all the desserts and the chocolate fountain were quite popular with the kids! 🙂 So awesome! It was the perfect weekend away for us! 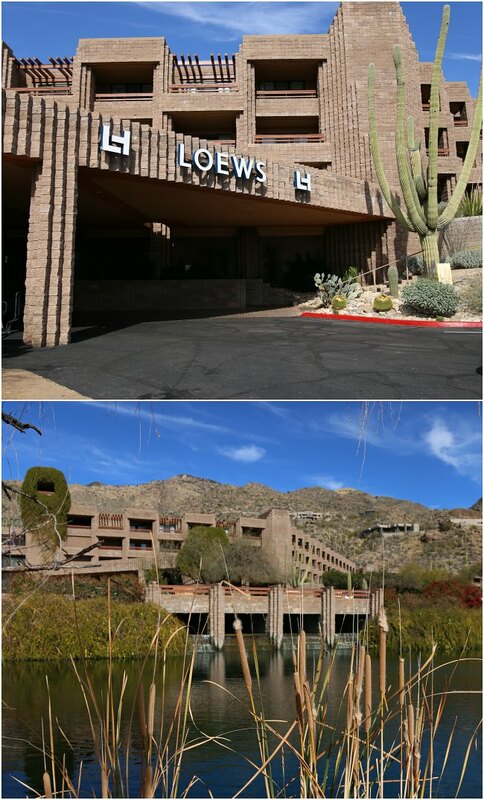 For reservations, more information on the resort and special offers, visit www.loewshotels.com/ventana-canyon/. I don’t think you can go wrong with spending a weekend (or more) here! We loved it and can’t wait to go back some time! What fun feature looks best about Loews Ventana Canyon Resort to YOU? Disclosure: This post is part of a sponsored press trip with Loews Ventana Canyon. However, all opinions, experiences, and photos are entirely our own.We loved this area of Tucson long before ever working with the resort! That bathtub looks huge! 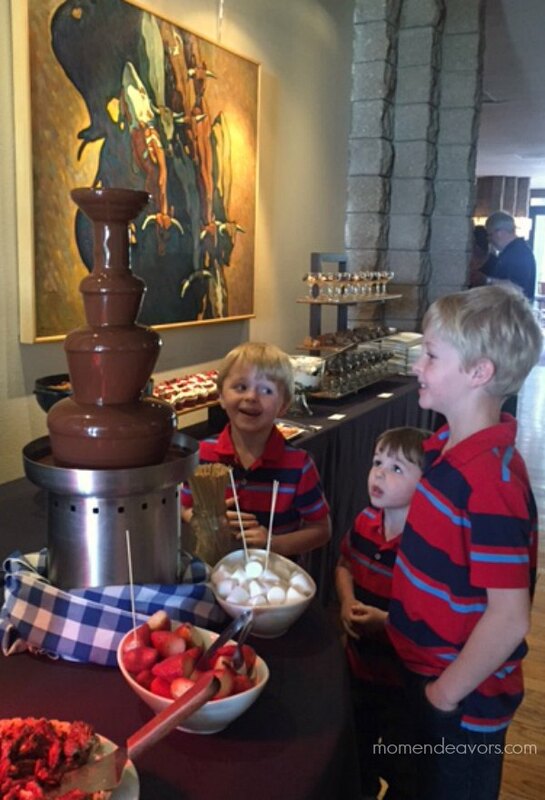 I love the look on your boys’ face at the chocolate fountain lol! Love this look into the resort! This resort looks VERY RELAXING, and very inviting to escape from the hustle & bustle of city life & noise. I lived in Tucson for 7 years and loved the desert and the acreage of the desert floor, but have noticed the Tucson has grown by leaps and bounds, but I’m very appreciative that there are sections of Tucson that are left alone and the real beauty of the desert shows and is (very relaxing and calming).